In a recent interview with Billboard Fall Out Boy bassist / lyricist Pete Wentz stated of the bands aims that “We need to be relevant to pop culture, which means we need to be played on the radio” and listening to his bands sixth LP you very much get that feeling. Over the last fifteen years or so the four-piece have explored their sound, and continue to do so on American Beauty / American Psycho, which pick up where the radio-friendly Save Rock & Roll left off. If you liked that record, then you’ll like this one but If, like me, you preferred where the band were musically ten years ago then that probably won’t change, and you might be best treading lightly where the band’s latest release is concerned. It really does seem that simple, but here’s a full review anyway. Irresistible opens the record strong and begging for a Diplo remix, a huge chorus erupting from nowhere and setting the bar high at the offset, a promising introduction to a record which constantly hits highs but perhaps not those of its first track. Along with euphoric The Kids Aren’t Alright the two mark the standout tracks during a reasonably strong first half, both beating the stomping yet sloppy title track and Centuries, which had already been spoiled for me by a Uni flatmate insistent on singing it as loud as he can seemingly all of the time. Granted, it is a very catchy song, so I can’t really blame him for belting it at three in the morning; Patrick Stump’s vocal gymnastics, along with the tracks inspirational intentions encourage a mass sing-along, aided by the frequent woah’s and oh’s during another large chorus. These moments are designed to spark a reaction from an audience, including my flatmate, but they often feel hollow, and it’s the more reserved moments on American Beauty / American Psycho, the sparking, sentimental selections such as Jet Pack Blues which evoked a positive reaction from myself, who felt slightly disappointed by the overly cinematic feel to tracks like Centuries. 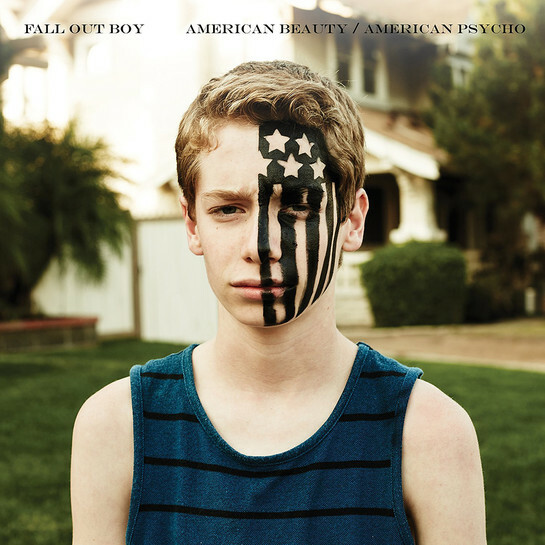 American Beauty / American Psycho is packed with singles, and it’s easy to envision each song playing during daytime radio or trailers (as Centuries and Immortals already have). Fall Out Boy know how to write a song, that’s never been in dispute, but the songs they write on American Beauty / American Psycho often lack any real substance, a lasting quality outside of big hooks and climbing Stump melodies. There’s plenty about these songs to justify their commercial accessibility, but not necessarily enough to make them stick around after they’ve finished. That’s the case with the second half of the record, which often falls short, with tracks like Favourite Record and Novocaine featuring larger than life choruses but also fading from the memory far too quickly once they’ve fizzed out. Towards its end American Beauty / American Psycho does grow repetitive, dragging out worn formulas, and the record becomes somewhat tiresome as it reaches its final few selections. The song are grandiose and soar, but they soar constantly throughout in similar fashion, and if the record begins fresh with Irresistible it begins to grow stale with Immortals, which leads into lacklustre closer Twin Skeletons (Hotel In NYC). Another issue I took with the record was the absence of any noticeable guitars; at closer listen they’re discernible, but they offer very little, and at times they feel unnecessary, almost afterthoughts on the likes of Twin Skeletons, on which they may as well not feature. It’s a sign of the direction Fall Out Boy are taking, continuing to explore, but their ‘absence’ isn’t always a welcome one. The songs, although crisp and polished, lack any real bite as a result, and the majority of the workload falls on Stump and drummer Andy Hurley, both of whom put it an excellent performance. It’s arguable that American Beauty / American Psycho features Stump’s best performance to date, he’s untouchable at times, capturing the bands skyscraping ambition even when the other elements of the song fail to, set free as he was on his solo LP Soul Punk, see Fourth Of July as a towering example, with Stump singing ‘You and I were fireworks that went off too soon’ with trademark enthusiasm and vivacity. Wentz’ biggest contribution is to the records lyrics, and these are fairly hit and miss, with Favourite Record relying on lazy repetition to carry the verses, throwing in numerous ‘woahs’ in the latter stages as if there was nothing better to say, a complaint I have with most ‘pop’ songs, and at times the record is far too ‘pop’ for my liking, lacking a punk edge. American Beauty / American Psycho begins 2015, and at the start of 2016, realistically, there’s only three songs here which I can still see myself still listening to. Two years on from Save Rock & Roll only a few tracks from that record receive regular listens, and the band’s latest release already seems condemned to the same 30% success rate fate. In contrast I make a conscious effort to listen to all of Take This To Your Grave or From Under The Cork Tree on a weekly basis, that’s ultimately where I stand on the Fall Out Boy of the past and the Fall Out Boy of the present. The modern incarnation of one of my favourite bands writes songs which entertain me, sure, but these songs very rarely leave a lasting impression, and to be honest I’m mostly okay with that. American Beauty / American Psycho is a fun record through and through, and even though it lacks substance or depth it’s still pretty good taken for what it is; a pop-rock album of the catchiest nature. There isn’t a single ‘bad’ song on here, but neither is there anything truly special. Did I like American Beauty / American Psycho? Absolutely, but this isn’t the FOB I grew to love as a teen, nor did I expect it to be, and although it’s likely unfair to judge the band on past merit I can’t help it. I’m all for progression, and applaud the band on their evolution, but for now I’ll stick to the old stuff, perhaps revisiting the few occasions on which AB/AP really shines from time to time.